People generally don’t listen carefully to the announcements on the Taipei MRT, a subway/elevated train mass-transit system. With four languages to get through — Mandarin, Taiwanese, Hakka, and English — that’s a lot of talking. And anyway, the cars can be so full that it’s hard to hear such things clearly over all the background noise anyway. Still, you’d think that at least the people who make the recordings would be paying attention. Or at least what I typed above is what the announcement is supposed to give. As you may have noticed, however, “Zhōngxiào-Xīnshēng” is rendered “Zhongxiao-Xinshang,” with a very un-Mandarin shang that rhymes with the English words clang, pang, hang, and sang. And that’s without getting into the matter of tones. I pointed out this error to Taipei City Hall and the authorities in charge of the MRT. 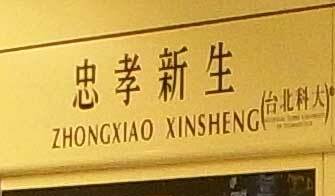 As usual, I had to spend some time repeatedly explaining: “No, Xinshang is not the English pronunciation of Xīnshēng. Xīnshēng isn’t English. It’s Mandarin. What the announcement gives is simply an error….” I was pleasantly surprised, however, that the main person I spoke to at TRTS did not require the usual explanations. He understood the problem and said it would be fixed. This, however, was a couple of months ago. The recordings have not yet been changed. I haven’t been holding my breath over this, though, because the official with the MRT system warned that it would take time to run a public bid notice for a new recording, make the new recording, and then install the recording in the front and back cars of some 100 trains. Still, the system has been known to move fairly quickly; unfortunately, this usually happens only when the change is for the worse, such as renaming Xindian City Hall as Xindian City Office (now Xindian District Office), or renaming the whole Muzha line because some superstitious nitwits thought that a joking, non-official nickname was bringing the system bad luck. For longtime residents of Taipei, the shang mispronunciation will likely bring back memories of the bad old days when the MRT system first opened. Back then the signage was predominantly in bastardized Wade-Giles, with the pronunciations in the English announcements matching what a clueless Westerner might say when shown names like Kuting and Nanking (properly: Gǔtíng and Nánjīng, respectively). Perhaps the most offensive pronunciation on the system then was given to Dànshuǐ, which at the time was [mis]spelled Tamshui on the MRT system. This was pronounced as three syllables: Tam (rhymes with the English word “dam”) + shu (“shoe”) + i (as in “machine”). By the way, the Xinbei City Government has been changing signs around Danshui from Danshui to the old Taiwanese spelling of Tamsui (note: not Tamshui). But more about that in a different post. This entry was posted in Chinese, general, Hokkien, Hoklo, languages, Mandarin, pinyin, romanization, signage, Taipei, Taiwan, Taiwanese and tagged danshui, mrt, subway, tamsui by Pinyin Info. Bookmark the permalink. Don’t go too far as we still got the ? ?, ?? ?, ??, ? ?, ??, ? ?, ??, ? ?, ?? issues. And native Mandarin speakers keep on calling themselves’ names using English pronunciation rules, even without tones? So what? Isn’t the official language in Taiwan English? Isn’t Taiwan the 51st state of the US? Don’t forget the ?? Who Fears Nat’l Park http://www.spnp.gov.tw/ . U.S. subway lines should feature announcements in English and Messed Up English too. Superstition? AFAIK the original name was ?? Zhàhú which is the same pronunciation as ?? zhàhú and it refers to when someone thought he or she won a game of Mahjong and pushes his tiles over. It’s not so much bad luck as just goofy. Besides, ?? sounds better anyway and makes more sense as ?? and ?? is now ???. Well, at least the Tamsui thing is good news! I hope one day they go the whole way and change to Tai-pak, Tai-tiong, Tai-lam, Ko-hiong (Ta-kau would be even better), Mieu-lit (Hakka) and Squyaw (Huan-shan- this is an Atayal Village in Tai-tiong County) and also encourage Taiwanese and mainlanders to romanise their names according to their ancestral language. That would really get up the nose of the Chicoms, and it would raise the profile of languages other than Mandarin in Taiwan. The Tamsui thing is excellent news, because foreigners (the only people using romanised signs) just love having more variations on the spelling introduced. They also deeply care about the variety of aboriginal languages as they desperately try to find their way around. Nothing like spending lots of money to erect signs which are useless to foreigners and locals alike. Good job. Does Mayor Chu has permission from the Ministry of Interior to change the official romanization to “Tamsui”? At least with “New Taipei City”, he first obtained permission from the Ministry of Interior to change from Xinbei City. But in this case, he seems to have made a unilateral decision without even asking the central government (who still use Hanyu Pinyin Danshui), or consulting with neighbouring Taipei City (who also use Danshui). The result is another necessary mess. Someone needs to slap him down, this isn’t the first time he has exceeded his powers. The “Tamsui” switch was planned before Zh? Lìlún’s election, so he shouldn’t be the one to get the blame … or praise, depending on one’s point of view. It’s true that naming is the central government’s jurisdiction. Xinbei, however, has requested that the Ministry of the Interior “respect” Xinbei’s decision in this regard. So far that seems to be working. But the central government and Taipei metro are still using “Danshui”. What gives? I guess you can argue that using the name “Tamsui” is appropriate for historical reasons. I lived in Taiwan in the 1990’s when one street in Taichung was spelt three difernet ways. Chung-kang Road Jung-gang Road and Taichung Port Road. You know what I did to avoid confusion and not get lost? I got off my arse and learnt how to read some Chinese characters. Problem solved. Good on you for working to solve the problem that Taiwan’s signage presented you with. Taiwan’s extensive signage problems, however, are unaffected by that particular approach. In that case, why include Romanized signage at all? The government clearly believes it is necessary to provide Romanized signs for the benefit of those who cannot read Chinese characters. This being the case, they might as well get it right.